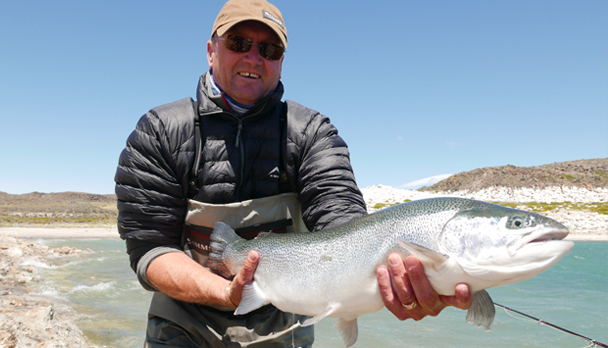 Jurassic Lake Lodge is a world class operation located in one of the most remote and wild spots of the Argentinean Patagonia. 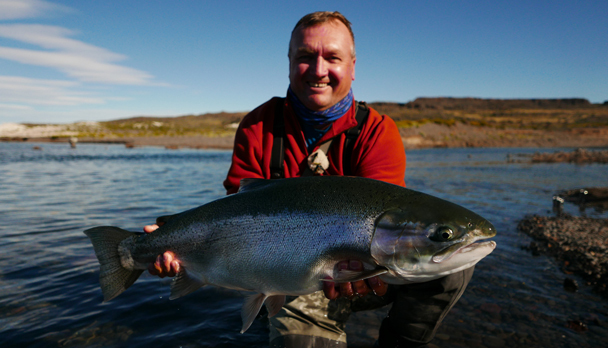 Jurassic Lake Lodge is a world class operation located in one of the most remote and wild spots of the Argentinean Patagonia. 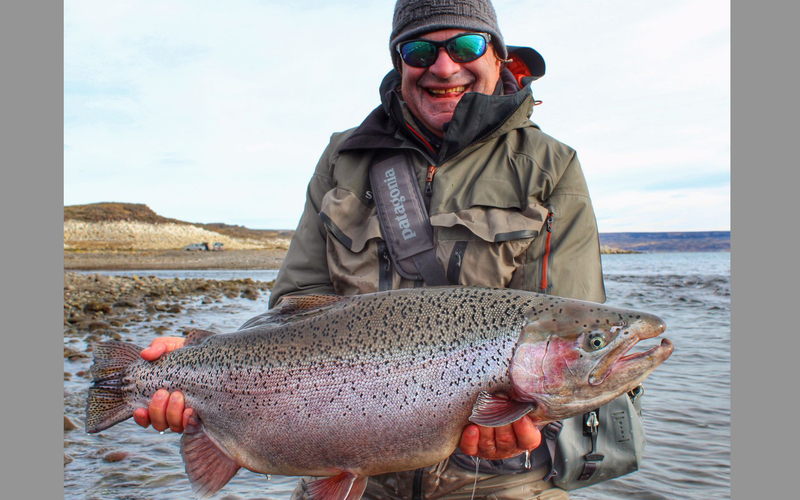 The lodge is strategically situated only meters away from the most and only really significant tributary of the Strobel Lake, the Barrancoso river, a crystal clear water river which together with the Lake create the best fishing system of the world to fish rainbow trout. 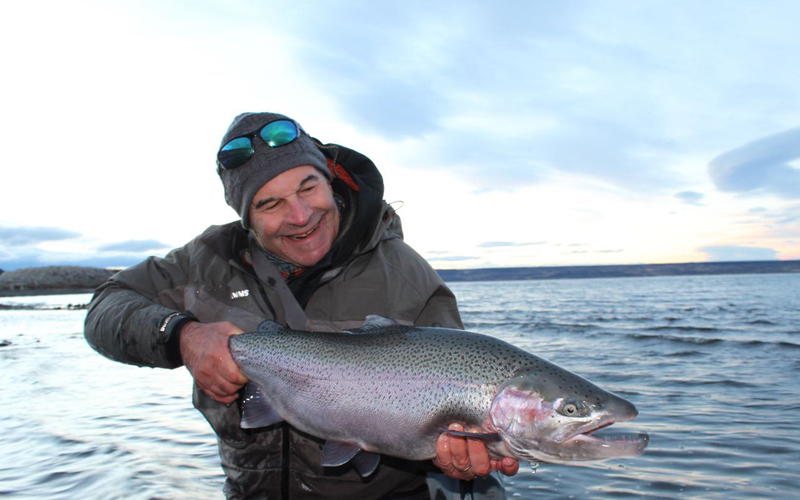 The Stroel lake is a water eye of 65km2 with only one tributary and no way out, home of a huge population of wild rainbow trout. 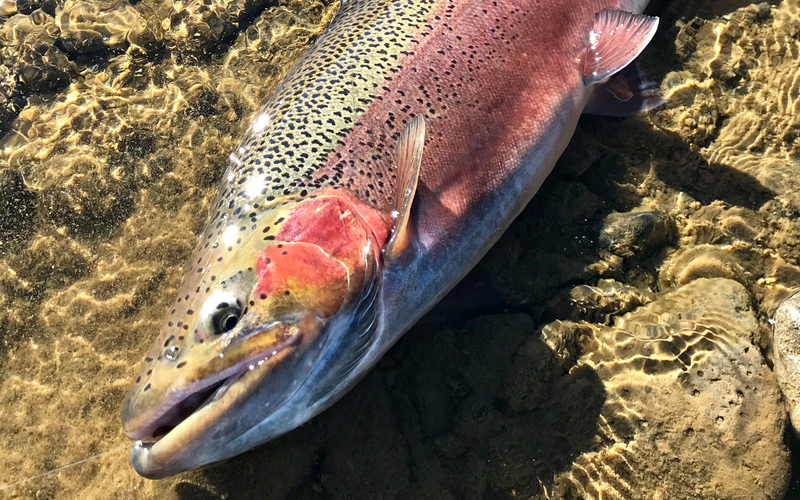 Thanks to big amount of food available, trouts have reached record sizes with a size average of 10 lbs and a large number of fish around 20 lbs. 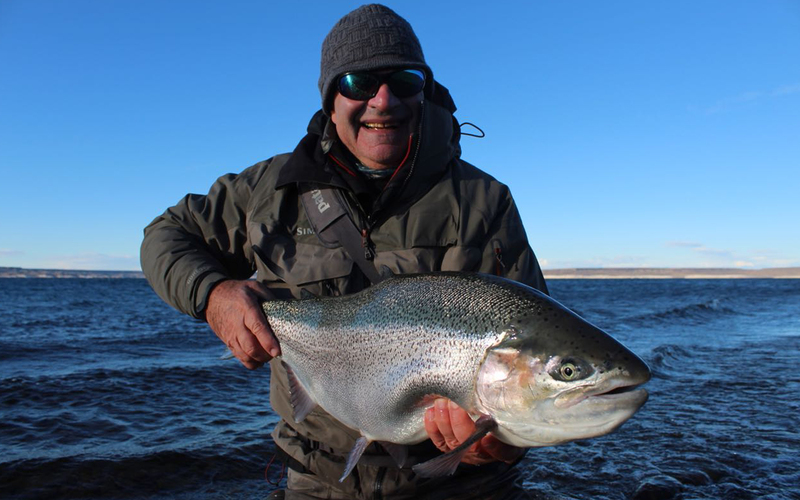 The lodge has privilege to access the best beats of the lake (10 km of coast), despite the fact that the whole lake can be fished, including the only river mouth and almost a 95% of the Barrancoso river (25 km), besides other smaller lagoons hosting trouts of around 5 lbs. 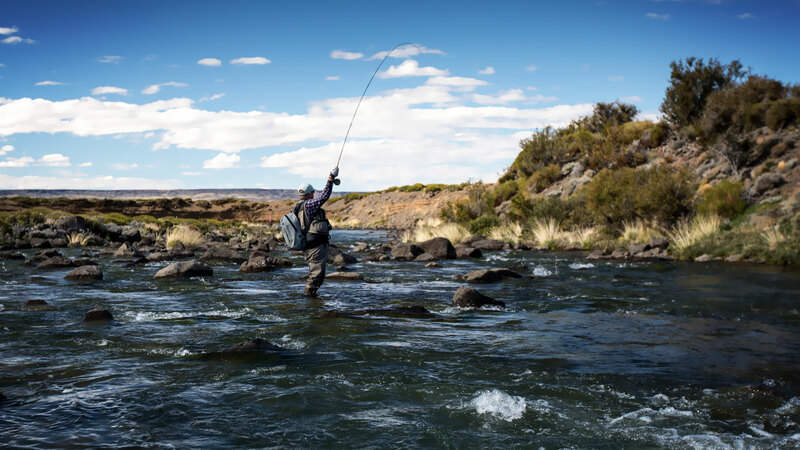 During the high water season, many of this smaller lagoons get connected through streams where is possible to fish with light tackle those fish migrating from one lagoon to another. Year after year and during all season long, big schools of trout approach the river mouth and nearby bays, to then swim upstream in order to spawn. The lower section of the river fills up with "fresh" trout, its silver colour is characteristic at this instance, so is their strength and acrobatics. 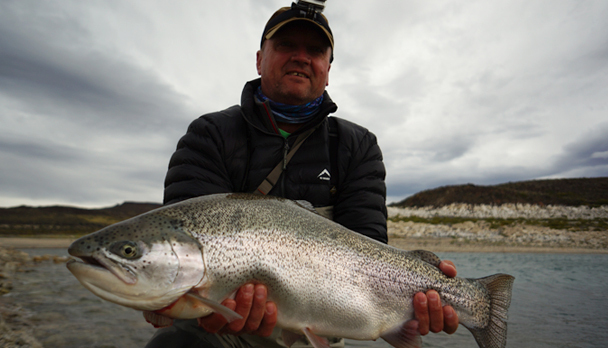 The daily capture average is unbeatable in any other part of the world, with anglers having landed more than 50 trouts. Day 0: Arrive Friday afternoon to Comodoro Rivadavia and overnight in the city. Day 1: Morning transfer to domestic airport and charter flight to Jurassic Lake Lodge (1 hour flight). Arrival to lodge, accomodate in rooms and equipment preparation for half fishing day. Days 2 to 7: Full fishing days. Day 8: Saturday morning departure back to Comodoro Rivadavia in Charter Flight. 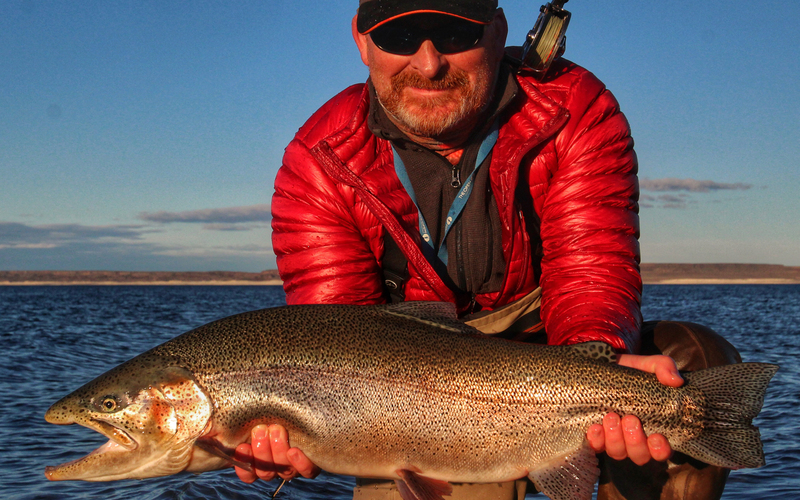 Jurassic Lake Lodge used to be more like a camp style program, but during the past season the whole operation has improved with a more ambitious goal to satisfy the high demands of international anglers. This season the lodge has built 5 big bedrooms, 3 double based and 2 triple based, with comfortable beds, private bathroom, hot water bath and good heating. The living room has a panoramic view of the lake's river mouth and is set together with the dinning room, there's a TV, WIFI and energy 24 hrs. The lodge has an excellent chef who will delight customers with typical patagonic lamb and traditional asado, as well with a varied international cuisine paired with argentinean prime wines. Arriving to the lodge used to be a very long and tedious trip of 6 to 8 hours through roads in very bad conditions, only accessible in 4x4. The road was baptised "Road to Hell"
One of the main changes during last season was the construction of a landing strip for private charter flight, only 20 minutes away form the lodge. Clients will fly in Comodoro Rivadavia airport, 2 hour flight form Buenos Aires, where they'll take the private charter flight, a dual motor Twin Otter with 19 seats, and fly in Jurassic Lake Lodge after 1 hour flight. The best rod to fish the Jurassic Lake is a 7 Wt 9-foot rod with Intermediate line. The reels should hold at least 100 yards 20-pound backing. 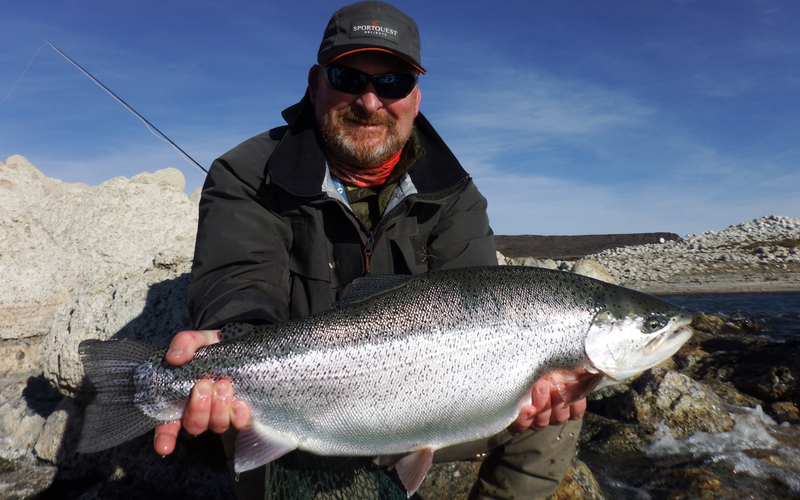 On the days that are not windy, a 6 Wt or 5 Wt can be used, with floating line and dry fly. Flies: Orange, brown, olive streamers tied on hook #4 to #8 and nymphs on hook #4 to #14. Legged dry flies (such as Chernobil, Madam X, etc) have proved very effective in the days with no wind. 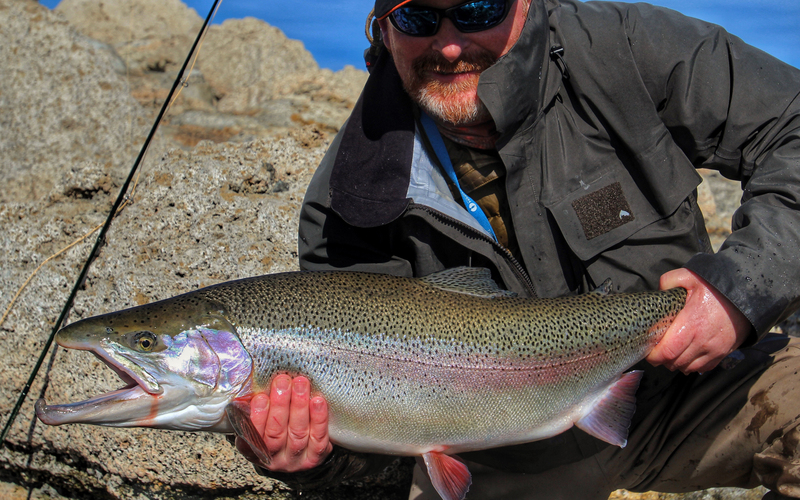 Leaders: The trout are not spooked away by the leader, so we recommend a shock tippet of 10 pounds minimum. 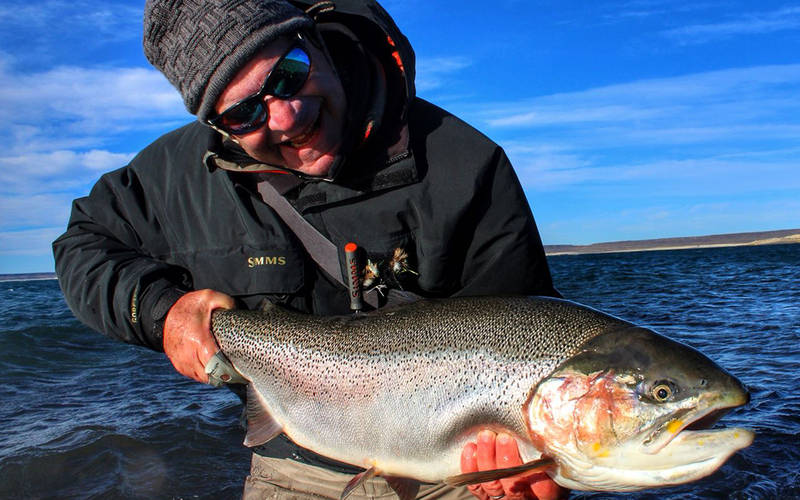 Rates include: Roundtrip charter flight Comodoro Rivadavia - Jurassic Lake Lodge, ground transportation, 7 night accommodation, 6 1/2 full fishing days, all meals and beverages, fishing license. Rates do not include: Round trip flight Buenos Aires - Comodoro Rivadavia, extras in Comodoro Rivadavia, health insurance, fishing equipment and flies, gratuities. Very good weather, sunny days and almost no wind� it was like fishing in the flats of the Caribbean! 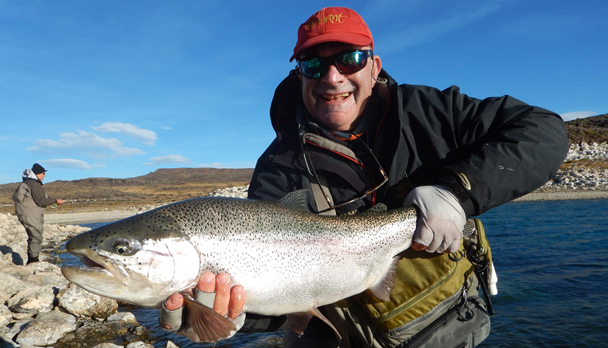 Great fishing with dry flies, with an average of 50 fish over 7 lbs per week and some between 11 and lbs. Two years went by since my last visit to Strobel. Saturday April 7, very early in the morning, we got transferred from the hotel to the local airport in Comodoro and flew towards the landing stripe especially built by the Jurassic Lake Lodge, 20 minutes away from the lodge. The flight lasted no more than 2 hours in a Twin Otter 300, and by noon we were already in our comfortable rooms getting our stuff unpacked. 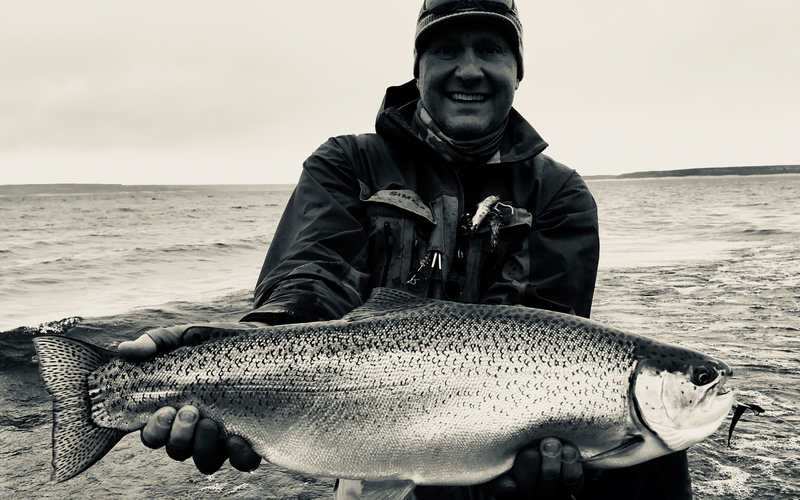 During the week there were only 6 of us fishing, this made easier the rotation of spots without stepping in each other�s area during the best fishing hours. 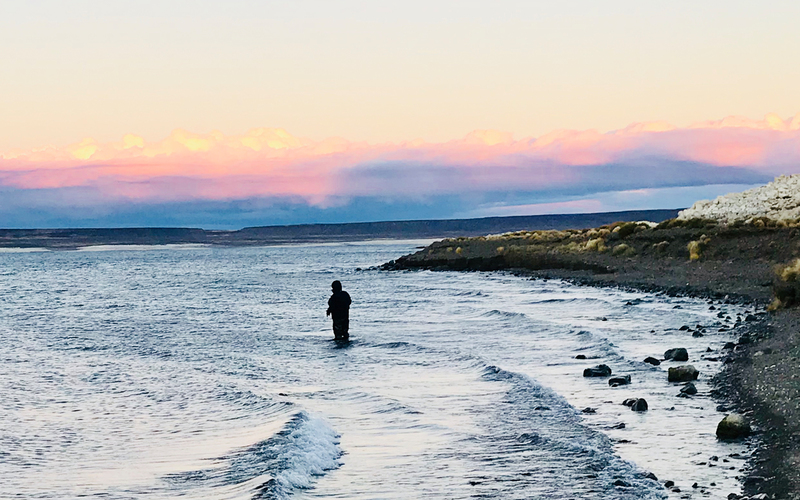 The weather presented cold and windy for the upcoming week, nevertheless the fishing was really good and only when it was very cold the fishing activity decreased a bit. We fished from 9 to 12:30 hrs and from 16 to 16:30 hrs, with double hand rod which resulted the best option to achieve longer distances. It was notorious the difference from those who kept on with one hand rod, they got less hook ups. The most popular flies were nymphs (Prince, Scuds, Copper John, etc�) and some small Wolly Bugger in olive, black and white colors. Floating lines and intermediate in special occasions, with leaders 9 to 12 ft and from 12 to 16 lbs. In very few occasions we could fish with dry flies, foam style, only late in the evening when the wind was calmer and it was really fun because fish (6 to 11 lbs) bit the fly very gently but then gave a nice fight. Trout in this time of the year are strong and give a decent fight, during the week I was able to fish around 50 between 6 and 20 lbs., many of them silver and healthy. 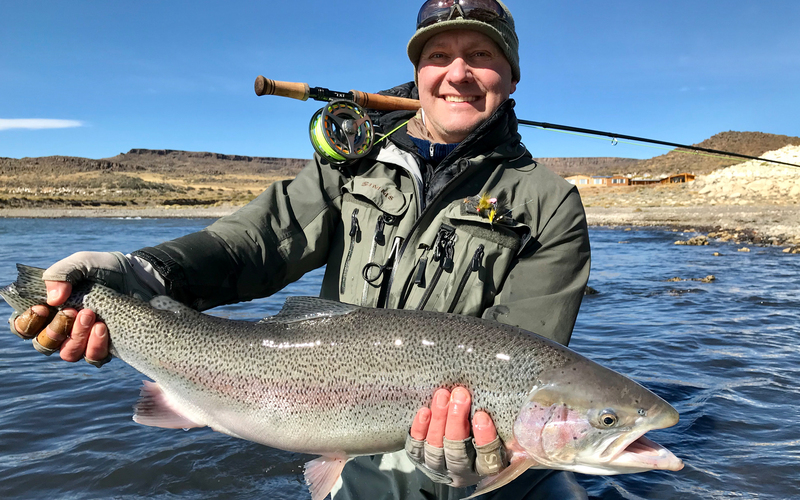 Summing up, this is a program for those seeking trophy trout, staying at a high quality lodge with great service, in very comfortable rooms and bathrooms with hot water, delightful cuisine and next to the fishing spots. 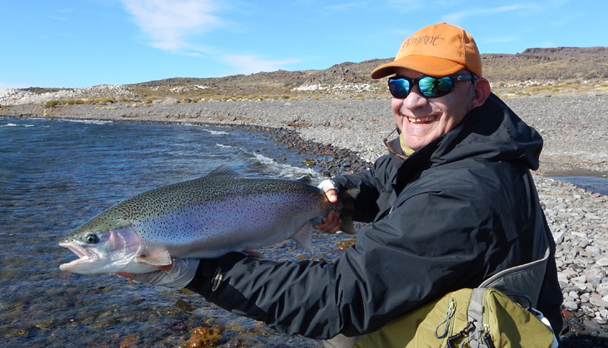 The 14th in the morning we flew back to Comodoro after an excellent fishing week. You know how it is; going to a new destination you read a lot online , listen to other anglers that fished the destination. Again I had it all figured out�. All the right flies were tied�.. I had a mental picture of the lodge, the nature, the lake.. In short; I had a game plan ready!�. And again I was wrong! The fishing at Jurassic Lake Lodge was more demanding, more technical and much more interesting than I imagined. Add to that friendly staff and guides, a robust lodge that takes care of your needs and really good food (and wines). Then you have the making of a great fishing week! Fishing the lake was a bit tricky, the fish were there but not going for your fly in every cast. 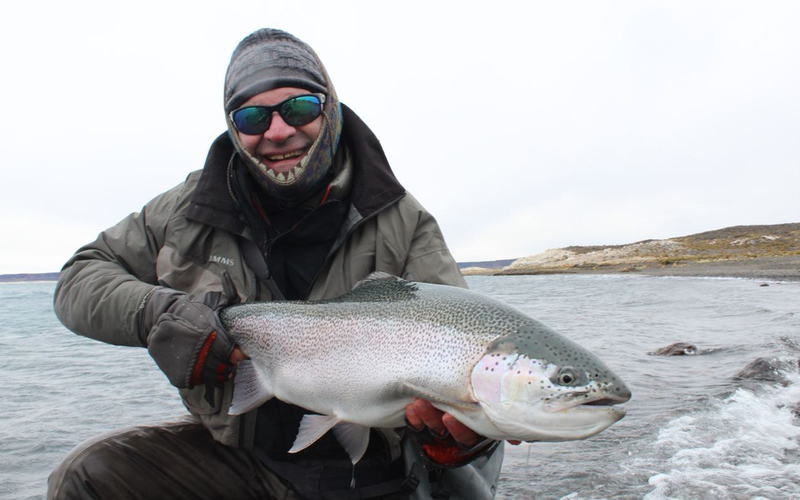 A longer leader and careful selection of fly and fishing method was key to have some hookups! A (very) slow retrieve with an olive wollybugger or a black leech kept the fish biting. 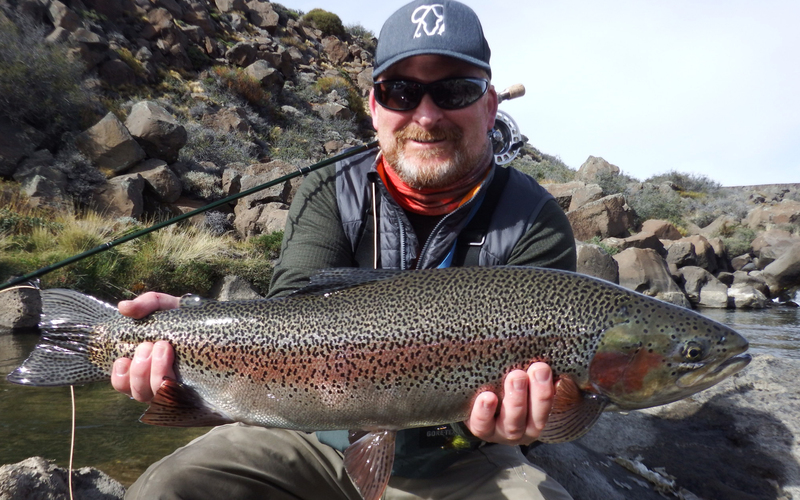 I fell in love with the small Rio Barrancoso, packed with fish from 5-25 lb. A red worm fly presented under an indicator was the killer combination at least for this week. The trip to Jurassic Lake was off the charts fishing, with the 3 of us landing 150 fish plus, getting our best fish a few times! Steve got 20, 22, 24 and 26 pound fish being the biggest one between 30 to 35 pounds upon the weight table. The place in general seemed a little bit overbooked at times and we were able to fish 3 spots only. The lodge in terms of food, facilities and wine, was all first class! We believe that sometimes guides could have helped us talking photos and assisting more, but wasn't a real problem at all. It was a good trip and would definitely recommend it.